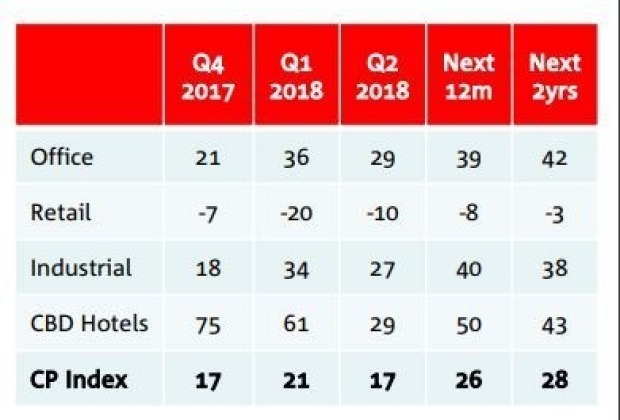 Sentiment in the commercial property market has fallen as the outlook in the booming hotel sector eased and retail expectations remain negative, according to a quarterly National Australia Bank survey. The index overall – covering the office, retail, industrial and CBD hotel sectors – fell four points to 17 in the 2018 second quarter but still holds at three points above its historical average. Sentiment in the bouncy CBD hotels segment fell the most, down 32 points to 29, despite high occupancy rates and a favourable outlook for international tourism. The outlook for office property also fell moderately even though the sector has enjoyed above average capital and rental growth. Sentiment for industrial property space also dipped. The NAB Commercial Property Indexfell x fell 4 points to +17 in Q2. For the retail property sector, sentiment has actually improved but it still remains negative at -10. Confidence in the sector went negative for the first time in five years in the previous quarter. “Retail sentiment was again negative as subdued retail business conditions and slow wages growth continued to hurt consumer sentiment,” said NAB Group chief economist Alan Oster. “Confidence in office markets was little changed with the sector continuing to benefit from strong demand in key states and nascent signs of recovery in previously under-performing states,” he said. Office property is expected to mostly lead the other sectors for capital and rental growth over the next one and two year periods. Office markets in New South Wales and Victoria will provide the best returns, according to the NAB survey. The NAB Commercial Property Survey canvasses the outlook among 300 property sector respondents, including real estate agents, developers, asset and fund managers and investors. Development commencement intentions were less positive. Overall, the number of property developers expecting to begin new works in the next month fell to a survey low 4 per cent in the second quarter, down from 13 per cent in the first quarter. “This could be suggesting less successful developers may be leaving the market,” the NAB survey report said. At a sector level, the number of developers targeting residential development projects rose to a high of 65 per cent. That confidence came even as a recent improvement in accessing funds reversed in the second quarter, with more respondents indicating that it was harder to obtain loans and equity. “More property professionals are now also expecting their funding conditions to worsen in next 6 to 12 months,” Mr Oster said. Some 62 per cent of those surveyed expect the next Reserve Bank of Australia move on rates will be up. A majority of respondents believe that if medium to long-term interest rates continue to rise, it will cause property values to fall by less than 10 per cent.